The second-generation 2017 Porsche Panamera is now available to buy, with more power and better fuel economy. Prices for the BMW 7 Series and Audi A8 rival start from £66,000. 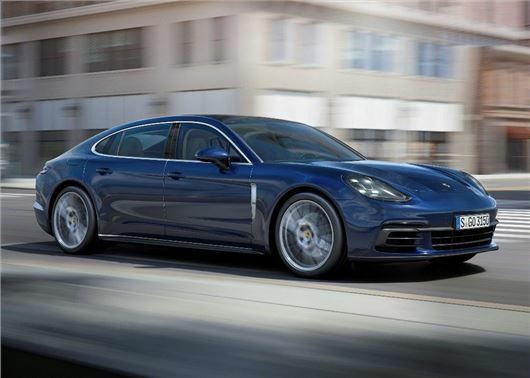 The first generation Panamera was launched back in 2009, but now has been replaced with an all-new model with more tech, better performance and long-wheelbase bodystyles. The four-door coupe retains its familiar shape, with 911 styling cues, long sculpted bonnet and a long muscular shoulder line. The most powerful 550PS V8 turbo model covers 0-62mph in 3.7 seconds and will reach a top speed of 190mph, while claimed economy is 30mpg and 215-217g/km of CO2 thanks to the use of cylinder deactivation engine technology. The 322PS diesel model – badged as Panamera 4S diesel – will be capable of reaching 177mph and accelerating from 0-62mph in 4.3 seconds, while official economy peaks at 42mpg. Prices for the diesel start at £92,000, while the range-topping Panamera Turbo will exceed £110,000. Both get four-wheel drive and Porsche’s latest eight-speed PDK automatic gearbox as standard. If your budget doesn’t quote stretch to those heady heights then £66,000 will secure an entry-level V6 petrol with a respectable 330PS. The rear-wheel drive V6 will hit 62mph from a standstill in 5.7 seconds and provide up to 37mpg, according to the official figures. Both the V6 and Turbo models are available as executive models, with a 150mm longer wheelbase that extends the overall length to 5.2 metres. As well as more power, better economy and a new lighter chassis, the big Porsche features improvements to the cabin. The boot is 50 litres larger than before – at 495 litres – but if you fold the rear seats this can be extended to 1263 litres. Digital displays also replace the standard instrument dials, while the dashboard gets a 12-inch colour touchscreen with voice control and full smartphone integration. Online navigation is also improved while another useful equipment option, particularly for the benefit of the rear passengers, is the 10-inch displays integrated into the backrests of the front seats. Both of which can be detached and be used as tablets outside the vehicle.